Ajax youth player Ouasim Bouy moved abroad in January 2013. He signed a 3,5 year contract at Juventus Torino until 2016. 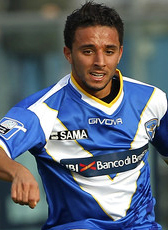 Just after the signing at the Italian giants, he went to Brescia on a loan tranfer for the rest of the 2012-13 season. In mid-season 2013-14, Bouy signed a loan contract for the rest of the season at Germany club HSV, then coached by Dutchman Bert van Marwijk. He continued a loan period for the 2014-15 season. His new temporary club was Panathinaikos Athens. In August 2015 Bouy moved back home again and went on a loan-deal to PEC Zwolle for the 2015-16 season. Bouy returned to Italy, renewed his contract with one more season and was loaned out again. This time to Palermo. In the first half of the season he played just twice in the Serie A. In second half therefore he went on another loan deal with more expectations. Bouy returned to his former loan club PEC Zwolle for the rest of the season. In August 2017, English side Leeds United signed the prolific midfielder on a 4-year deal from Juventus. Immediately after signing, he was send on a season loan to Spanish Segunda Division club Cultural Leonesa. In January 2018 he returned from his loan period to England. In summer 2018 he was send on another loan deal at his former club PEC Zwolle for the 2018-19 season. Bouy is a Holland U19 international from Moroccan origin.